"The wrath of God is justified!" In the 1990s I was involved in a church while it made the transition from a slide projector to a video projector for song lyrics. It was my expressed hope then that it would be an unnoticed tool that would help the congregation in the celebration of the Lord. For those like myself who stumble in singing a hymn, even with the lyrics in front of me, anything I could do to help seemed like a good idea. I was aware then, and far more clearly now, that there was danger in moving the focus from the Lord to technology and entertainment. I was concerned that we don’t justify entertainment by calling it worship. It appears we have done just that. By far my two favorite songs are “It Is Well with My Soul” and “In Christ Alone”. What I have found is that music is the seasoning for the meals of words. Some days you might be in the mood for tamari sauce and others for curry. The seasoning brings life to the meal as the music brings life to the lyrics. When I sing the words “My sin, oh the bliss of this glorious thought, my sin not in part but the whole, is nailed to the cross and I bear it no more” it doesn’t matter if it is a Capella, a steel guitar, or a massive organ providing the music. That is the seasoning bringing life to the words. It is the words “Praise the Lord, praise the Lord, O my soul!” that pierce my heart. A lot has been written about the events in 2013 when the PCUSA decided not to include “In Christ Alone” in their hymnal because Stuart Townend, the lyricist, did not agree to weakened words to replace what he wrote. I applaud his actions. This must be emphasized that it took courage and commitment for Mr. Townend and Mr. Getty, the composer, to not compromise. They have earned my respect and appreciation. At that time Timothy George wrote a good article on the subject titled “No Squishy Love” (http://www.firstthings.com/web-exclusives/2013/07/no-squishy-love). And here is where the irony that the Lord often orchestrates occurs. Timothy George is dean of Beeson Divinity School of Samford University. 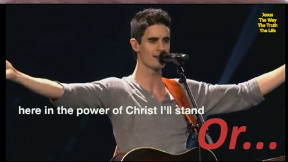 A former student at Samford, Kristian Stanfill, performed the song for a Passion concert also in 2013. The video is on YouTube and with reluctance this is the link: https://youtu.be/wNRFumI2ch0. By 2015 it has been viewed over two million times. It doesn’t use the weaker words, it removed the whole second verse. It disgusts me! These are the deeds of a coward. When I first started watching the video I realized that what I was concerned about in the 90s was happening before my eyes. Technology became the amplifier of the musicians and not the Lord. You can see in the video the large screens used to show close ups of the singer. This is not technology amplifying worship, but worship of a singer. Often in the video the singer has his arms stretched out is if he is the one on the cross as shown at the 5:00 minute mark. On the screen are the lyrics “here in the power of Christ I’ll stand”. However, the impression is effectively “here in Christ’s place I stand”. The words sung say one thing, but the technology, the lights, the big screen, and the outstretched arms say another. Adding “Jesus, The Way, The Truth, The Life” in the top corner of the screen seems like justification for self-glorification. While there is much detail given here for a single instance, it is not the instance, the artists, or those in the organization that concern me. This is just one manifestation of the tendency to entertain in the name of worship. By definition worship is not a concert, but reverent love and devotion. It is something you do from the moment you wake in the morning. Don’t confuse worship with entertainment. I know the power and joy of being with a crowd and singing to the Lord. I also know that I can use celebrating the Lord as an excuse to entertain myself in identical ways that you would find in any secular or cultic concert. Many, and I pray most, of the crowd were celebrating the Lord. I suggest those leading the crowd were pointing to another lord. What I see in this video is a mockery of my Lord who alone took on flesh, and gave me the gift of His love and righteousness. I scorned Him, but on that cross as Jesus died, the wrath of God that I deserve was satisfied as every sin of mine on Him was laid. Today I claim that in the death of Christ I live. Stuart Townend has my respect and my appreciation for what he has done in writing the words to this song. I have full confidence that Mr. Townend and Mr. Getty acknowledge that they are only the vessels the Lord used to bless us with this music and lyrics.